Horsepower Memories was on hand at this year’s Mecum Kissimmee auction. With all the million dollar Mopars being auctioned, we had to go and see this monumental collection in person. We definitely were not disappointed. These cars are some of the most sought after by collectors and it’s rare to see them all at one time under the same roof. Being there to witness these cars being auctioned was nothing short of spectacular. The bidder’s area was standing-room only and there was hardly an empty seat in the spectator grandstands. When it was time for these cars to cross the auction block, the excitement level was at redline. Mopars dominated this auction with these three cars topping out well over one million dollars. 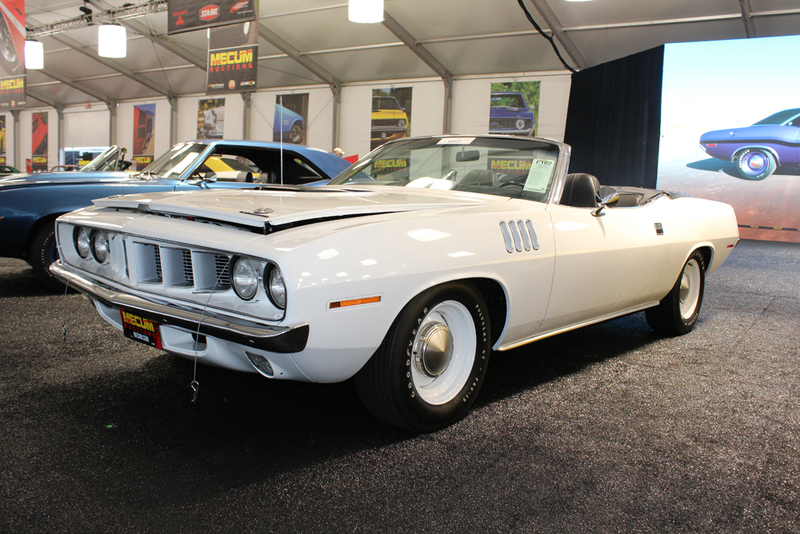 This 1970 Plymouth Hemi Cuda convertible caused quite a stir when it rolled on the auction floor and took center stage. Moments later when the auctioneer’s gavel pounded, this yellow beauty racked up a winning bid of $2,675,000. It also took the number one spot at this year’s Kissimmee auction. This rare Cuda is only one of five 4-speed Hemi Cuda convertibles produced during the 1970 model year. This 1971 Plymouth Hemi Cuda convertible came in a close second. The winning bidder took this one home for $2,300,000. This beauty is one of only five automatic Hemi convertibles to roll of the assembly line in 1971. This Cuda is a bit unusual with its column shifter and rare radio with microphone and cassette recorder. Next up is a 1970 Dodge Hemi Challenger convertible decked out in Sublime Green and black stripes. It is one of only nine Hemi Challengers that rolled out of the Hamtramck plant in 1970. 1970 is also the only year a Challenger convertible was offered. This highly optioned example drove off the auction floor with a winning bid of $1,650,000. These three muscle machines are proof positive that Hemi car popularity is at a fever pitch. Few other pony cars command the price that these rare examples obtain at auction. For more information about these cars and others, head over to mecum.com.